The Alexander McQueen by Sarah Burton Resort 2011 Collection drew inspiration from Hans Bellmer’s sinister doll drawings. Other Hans Bellmer-influenced collections : Acne Studios by Jonny Johansson Autumn/Winter 2012-2013 (this show was partly based on how artists such as Hans Bellmer looked at the body), Alexander McQueen Spring/Summer 1997 (this show, titled « La Poupée / The Doll », as an homage to Hans Bellmer’s 1935-1936 eponymous work, was dedicated to the German-French surrealist artist), Warren Noronha Spring/Summer 2002 (this show was inspired by Hans Bellmer’s papier-mâché doll art). 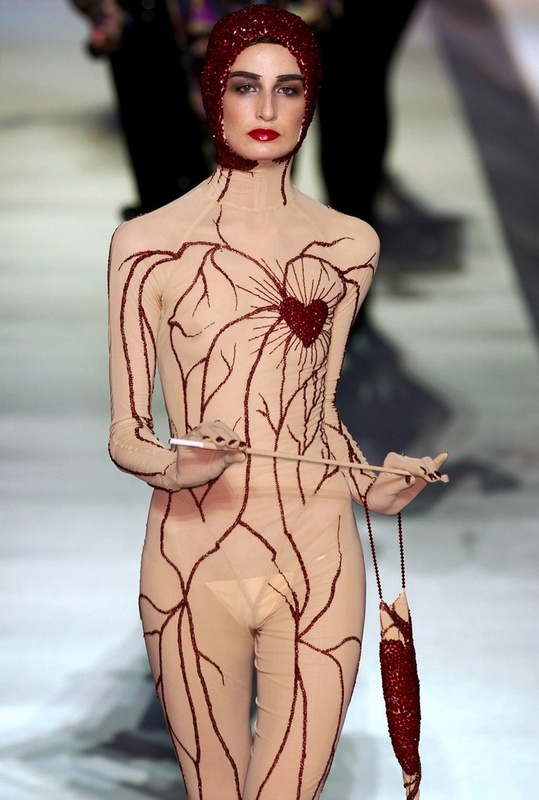 The « Homage to Cocteau / Hommage à Cocteau » look of the surrealism-themed Jean Paul Gaultier Couture Autumn/Winter 2003-2004 Show, titled « Morphing », paid tribute to Jean Cocteau. Other collections inspired by Jean Cocteau’s art : Bruno Pieters Autumn/Winter 2005-2006 (this collection was influenced by Jean Cocteau and Art Deco), Catherine Malandrino Autumn/Winter 2009-2010 (this show featured a pattern, showcasing 2 profiles, turning into a vase, originally designed by Jean Cocteau for Schiaparelli), Franck Sorbier Couture Spring/Summer 2007 (the « eye » strapless dress was based on Jean Cocteau), Jean-Charles de Castelbajac Pre-Fall 2014 (the starting point of this collection was a lithograph by Jean Cocteau, titled « Je me souviens de l’avenir / I remember the future »), John Galliano Spring/Summer 2011 (one outfit of this Maria Lani-inspired show evoked the portrait of Maria Lani that Jean Cocteau painted). Francis Picabia was one of the Dadaists who were referenced in the motifs of the Carven by Guillaume Henry Autumn/Winter 2014-2015 Show. 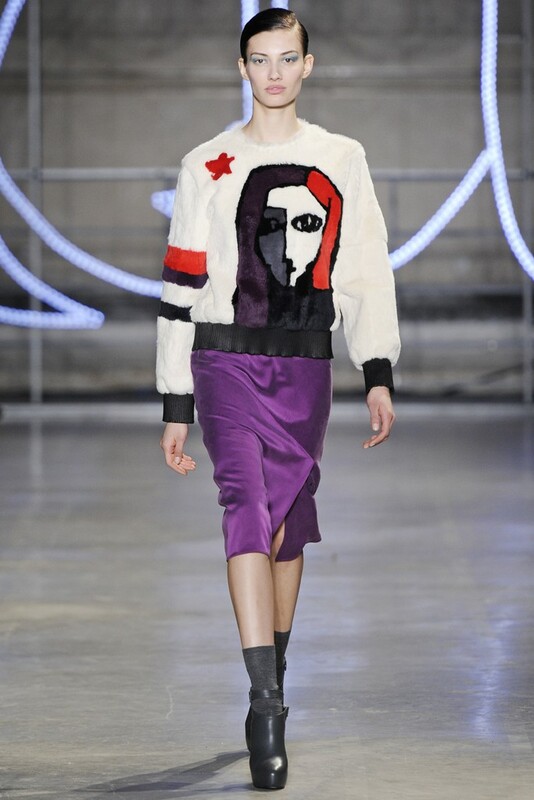 The strong use of femininity in Meret Oppenheim’s surrealist art has influenced the Jean-Charles de Castelbajac Autumn/Winter 2014-2015 Show, titled « Sportsoir ». Another Meret Oppenheim-inspired collection : Giambattista Valli Autumn/Winter 2008-2009 (Meret Oppenheim was referenced in this show). Paul Klee’s abstract paintings have inspired the watercolor patterns of the Novis Autumn/Winter 2014-2015 Collection. Other Paul Klee-influenced collections : Donna Karan Spring/Summer 2006 (some abstract motifs referenced Paul Klee), Loden Dager Spring/Summer 2012 Menswear. 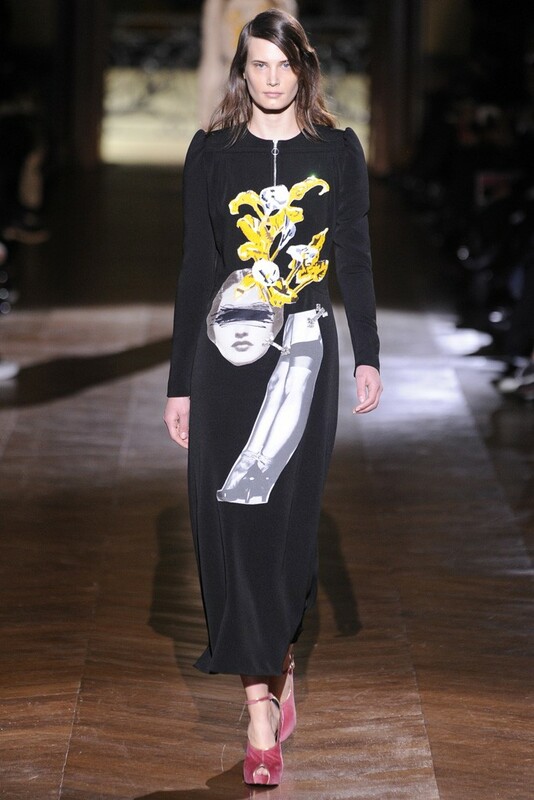 Remedios Varo’s surrealist paintings have inspired the Iris van Herpen Spring/Summer 2014 Collection.